House Of The Dead is one of those franchises that seems to stick around and be re-released time and again on almost every platform imaginable. It isn’t immediately obvious whether this is a testament to the simple, arcade-style gameplay that lends itself to many different control styles and hardware, or simple laziness on the side of the developers. But the fact that it keeps on happening must mean that SEGA is doing something right and that fans still want to play the game. 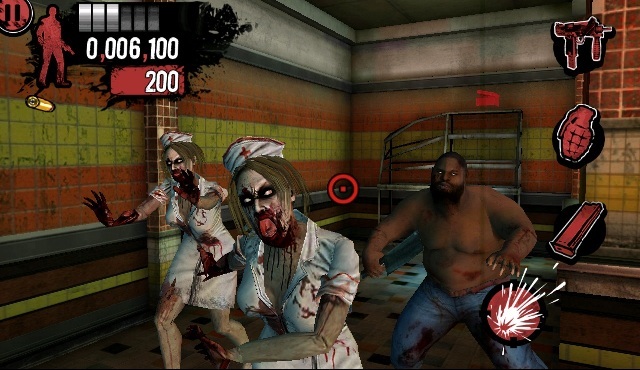 House Of The Dead: Overkill was somewhat of a re-imagining for the series. The games had always possessed a cheesy, over-the-top style, but Overkill was the first in the franchise to abandon any attempts at real horror, and to openly embrace its B-Movie characteristics. The game went balls-out, with F-Bombs left, right and centre, and played the entire thing for laughs – which was a largely successful endeavour. The title breathed some new life into the series, which was beginning to get a little over-burdened by its po-faced seriousness. It’s no surprise, then, that the game should come to mobile devices – now that it has been made more accessible to the casual market via the Wii and PlayStation Move.? Touch controls seem like the next logical step for the game, and so here we have The Lost Reels. Whilst the game is basically an adaptation of the original – with the subtitle suggesting a Director’s Cut of sorts – the game actually equates to a cut-back and shortened version of the Overkill. Sadly, it has actually been rather butchered. The swear-heavy banter and over-the-top cutscenes that made Overkill stand out – and that gave the game its new personality – have unfortunately all been sacrificed, both for the sake of keeping it smaller, and presumably to allow the game to be played by a broad range of gamers and not limited by its mature humour. This is, however, a big loss for the title, and without it The Lost Reels slips back into old habits and all comes across a bit too cliché and humourless. Thankfully, the control method has been handled very well, and the translation to handheld devices does seem like a natural one – that is, assuming you realise you can switch control styles. The default method is a bog-standard virtual joystick control scheme, where players drag a crosshair around the screen with one finger and tap to shoot and reload with another. This method affords great accuracy, but sacrifices speed and an element of fun. It feels like it would if you were using a mouse to play Time Crisis on your PC. It is the second control method that is the real winner though, and it seems like a perfect fit for the touchscreen interface – even if you don’t have to actually touch the screen as much! This method makes use of the accelerometer built into your phone, whereby players tilt their device around in order to aim their crosshair on-screen. You still need to tap the screen to shoot, reload and change weapons, but the idea that you actually physically move your phone around in order to aim feels very intuitive. You aim your device in order to aim – a control scheme that anyone could figure out, and one that feels natural. The game also looks and sounds pretty good for a mobile game – it won’t blow you away, but the sound effects and art style are effective. You will actually have quite a lot of fun blasting your way through the blood-soaked levels (swearing may be bad, but gore apparently isn’t), and the way in which the game works is very similar to its bigger brother – but this leads us onto the other major downfall of the game. As well as cutting out cutscenes and speech to limit the size of the App, Overkill also only manages to provide you with three stages to play through – and even one of those can only be accessed if you pay for an in-game upgrade of £1.49. Although the levels can seem fairly lengthy – with five mini-chapters within each – the gameplay is more or less unchanged from one to the next. 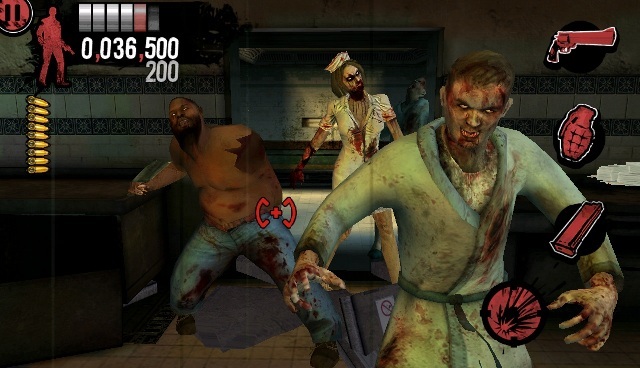 There is no real variation with the Zombies – you will have met all three varieties on multiple occasions by the end of level one, chapter one. A fourth Zombie class does exist – but again, that is only accessible if you stump up the cash for the third level. They do all attack in different ways, and this is mixed up a fair bit, but things do get a bit stale after a few chapters. Boss battles are included, but aren’t likely to blow you away either, as everything is scaled back a bit from what those who played the console version may remember. 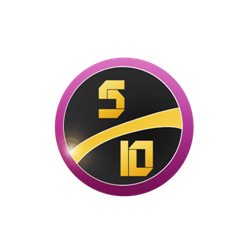 You do earn in-game money for your performances throughout levels – which can then be used to upgrade your weapons, for example – but you would have to play through the game a lot in order to buy all of the later guns. This won’t stop you from getting through the game though – once you’ve gotten the hang of the control method, the difficulty never really gets too high. You can of course pay for more virtual currency, and we begin to see the in-app purchase policy that SEGA has opted for really come to the fore. The Lost Reels’ longevity is severely hampered by content being held behind price tags – which is ok for a free App, but you have to pay £2.99 for this game initially. 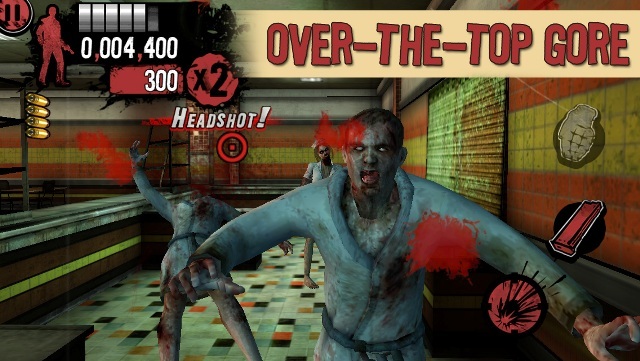 VERDICT: House of the Dead: Overkill – The Lost Reels manages to take an innovative and fun control system – and some truly funny and stylish source material – and chop it all up to hide it behind wall after wall of in-app purchases. The strong personality of the original is all but lost in this trimmed-down form, making the game seem more like one of the somewhat emotionless earlier entries in the House of the Dead series. Despite the fun that can be had with the title, The Lost Reels is just too short to warrant a full price purchase and SEGA have made the wrong decision in withholding so much content. It all takes away from the really great accelerometer control system – but we can only hope that it sees the light of day in another mobile shooter.